Remember when taking Matt Barnes with a late round pick felt like a steal? Barnes notched the save on March 29th in Seattle with two strikeouts. However, since then, he’s made four appearances with only one of them coming in the ninth inning. On April ninth, Barnes did get two outs, but also yielded a run on a hit batter, wild pitch and a double. He’s started his work in the seventh inning on two occasions and recorded the last two outs in the sixth inning on Friday. No matter the term associated with the highest leverage pitcher, it appears Barnes will enter when Boston needs him most, which recently, does not appear to be the ninth inning. Whilst fantasy owners attempt to chase the next save in the Seattle bullpen, April Fool’s, a pitcher not many talked about received the chance on Monday night. Roenis Elias notched his first major league save, he did record one in Triple-A last year in Pawtucket, throwing a clean inning against the Angels. Los Angeles did use pinch hitter Zack Cozart, removing one of the two left-handed hitters Elias could face, yet, he navigated the inning inducing a pop-out to third base, a fly ball to right field and a lineout to center by Kole Calhoun. Since transitioning to the bullpen, Elias improved his fastball velocity to 94 MPH and joins the burgeoning committee approach for the Mariners. A somewhat wild Friday evening will leave some fantasy owners sleepless about Seattle. Hunter Strickland will undergo an MRI on Saturday after experiencing tightness in the back of his shoulder. It could be inflammation, but resulted in Strickland blowing his first save of the year after convincing his manager to leave him in. Strickland allowed two hits, including a three-run home run to Mitch Moreland, and a walk in one-third of an inning. Roenis Elias finished the ninth inning getting a strikeout versus the two hitters he faced. If Strickland does land on the injured list, this could signal a committee approach in Seattle until Anthony Swarzak returns. 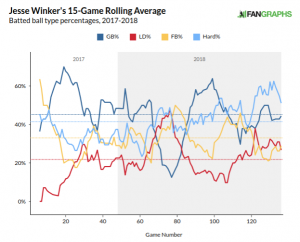 At a time when many players trade contact for fly ball rates to generate power, Jesse Winker could be emerging as a fantasy asset with a skill set rooted in plate discipline with power on the rise. Winker appeared in 89 games last year scoring 38 runs with seven home runs, 48 RBI and a .299/.405/.431 slash line. Unfortunately, his season ended abruptly due to a subluxation of his right shoulder, covered in detail by Mark Sheldon. While many questioned Winker’s power as a prospect, the article suggests he’s been dealing with the balky shoulder for 2-to-3 seasons. In spite of this, Winker flashed his upside for fantasy in this limited sample, making him an intriguing target for upcoming drafts. Before delving into the potential growth of his power, ignoring Winker’s prowess at the plate would be a mistake. He’s one of five players with at least 300 plate appearances last year to record more walks than strikeouts. This puts him in rare air joining only Jose Ramirez, Carlos Santana, Alex Bregman and teammate Joey Votto in doing so. Some guy named Mike Trout just missed the list with a 0.98 walk to strikeout rate. 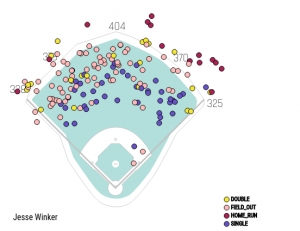 In terms of plate discipline, Winker finished with a 5.9 swinging strike percentage and made contact over 85 percent of the time. Winker also swung at pitches in the strike zone (Z-swing percentage) at a 65.3 rate punctuating his upside in terms of discipline. Steamer projects a very solid season for Winker with 75 runs, 17 home runs, 66 RBI, three stolen bases and a .284/.376/.437 slash line in 525 at-bats. Once again, using his xSTATS, Winker’s expected average from the last two years sits at a very respectable .288, and well within his outcomes for 2019, with owners hoping for a repeat of last year. This also applies to his home run projection as long as he can accrue at least 500 at-bats. News on his shoulder this spring will provide more clarity as to his health. With some luck, Winker could exceed his Steamer home run projection and reach 20, but it’s speculation not an expectation. However, 17-to-20 home runs with a .288 average could be more appealing than how people may perceive Winker. Especially considering only 20 hitters finished with a higher average than Winkler while accruing at least 300 plate appearances. Winker’s #2EarlyToMock average draft position finished at 211.1 over the course of nine drafts. His highest draft spot of 180 still leaves room for profit due to his potential upside. Discipline with an uptick in power and a strong supporting cast in Cincinnati not only make Jesse Winker a half season hero, but he’s a worthy target in the upcoming draft season. Trying to discern between second half breakouts as seeds sown for growth compared to a potential bust makes preseason preparation exciting. One name sure to be popular in the new year will be Franmil Reyes. During his 87 game sample in the majors last year, Reyes launched 16 home runs with a .280/.340/.498 slash line in 261 at-bats. It did not come without some adversity. He arrived to the majors with a propensity to hit for power along with racking up strikeouts. This proved to be true during Reyes’ first 104 at-bats during May, June and nine games in July prior to his demotion. Reyes hit six home runs but only walked seven times with 42 strikeouts resulting in a .221/.270/.423 slash line. Less than ideal. Getting a reset in the hitter friendly Pacific Coast League, Reyes finished with a robust 16 home runs in only 58 games at Triple-A with a .324/.428/.614 line. This led to his return to San Diego on August fourth. From this point forward, Reyes surged. Over his last 157 at-bats he scored 22 runs with six doubles, 10 home runs, 24 RBI and an eye popping .318/.385/.548 slash. He also hit safely in 20 of his 25 games in September benefiting fantasy owners who held tight or took another chance on Reyes upon his return to the majors. More encouraging, Reyes walked 17 times compared to 38 strikeouts in this time sample, showing growth in his plate discipline after his reboot in the minors. During Reyes’ time at Triple-A, he walked 14.8 percent of the time versus a 23.6 strikeout percentage. While this rate of discipline should not carry over to the majors, there’s room for growth seeing his 9.7 and 9.8 walk rates in August and September provide hope going forward. In these same two months, Reyes reduced his strikeout percentages to 23.6 and 20.6 respectively as well. In both May and June, Reyes produced strikeout rates at or above 40 percent. When trying to assess his potential average in 2019, some will depend on his ability to build on the gains in discipline during his second go around in the majors while he continues to adjust to hitting at this level. Reyes will also need to improve against right-handed pitching if he’s going to hit at or above his Steamer projection. At Triple-A, Reyes hit .359/.519/.564 against southpaws while slashing a very respectable .316/.404/.626 against right-handed pitchers in his limited 216 at-bat sample last season. When going back to his 2017 Double-A statistics, Reyes hit appreciably better against right-handed pitching (.292/.349/.514) than he did against left-handed pitching (.147/.233/.293). While this intimates Reyes remains a work in progress, he should be able to improve upon his splits from last year in the majors. Reyes hit .247/.298/.449 versus right-handed pitching with 10 home runs in 178 at-bats. Against southpaws, he slashed .349/.426/.602 with six home runs in 83 at-bats. It’s tough to predict how Reyes will fare versus each type of pitcher in 2019, but planning on some movement to the mean in each category seems salient. So, improved plate discipline baked in with past production versus each type of pitcher should allow Reyes to hold his own going forward. Transitioning to his batted ball data, Reyes should be able to achieve his Steamer projection of 69 runs, 28 home runs, 79 RBI, two stolen bases and a .251/.319/.456 line in 531 at-bats over 146 games. With home run production down last year, these will not be numbers to overlook. When trying to gauge his home run totals, Reyes displayed power throughout the minors along with the 32 he hit across two levels last season. But, trying to predict a total higher than Steamer’s will be difficult. Could he surpass this total? Absolutely. However, paying for more could be risky. According to Statcast data, Reyes averaged an exit velocity of 96.4 MPH on his fly balls and line drives put into play of his 181 batted ball events. Last year, Reyes made the most of his 33.3 and 23.9 fly ball percentages from August fourth on, but he’s not recorded a season with a fly ball percentage above 40 percent, once, during his debut season in 2012 in Rookie ball. It’s encouraging Reyes produced a hard hit percentage (44.2) and home run per fly ball rate (29.6 percent) above the major league averages. He’s also within five-plus percent of the major league average in fly ball percentage. Not trying to downplay his home run upside, but his ground ball rates of 45.8 percent in August and 53.5 percent in September cannot be ignored when projecting his best case scenario. Using xSTATS data, Reyes had an expected home run total of 12.7 last year with an expected slash of .268/.330/.465, an xBABIP of .346 and .OBA of .344 last year. These numbers along with his Steamer projection translate to upside. It’s apparent Reyes will be targeted from the 10th round on. In the #2EarlyMocks orchestrated by Justin Mason, Reyes carried an average draft position of 208.1 with a high pick at 165 and a low of 260 within the nine leagues. Due to his strong finish along with his power despite the ground ball to fly ball rates, Reyes will be worth the risk. As intimated above, using the Steamer projection as a guide to his baseline value, targeting “Franimal” to balance a draft with power and an average which will not tax the category makes perfect sense. Reyes could hit 30 home runs, or 24. Either way, he’s a half season hero who deserves the hype.